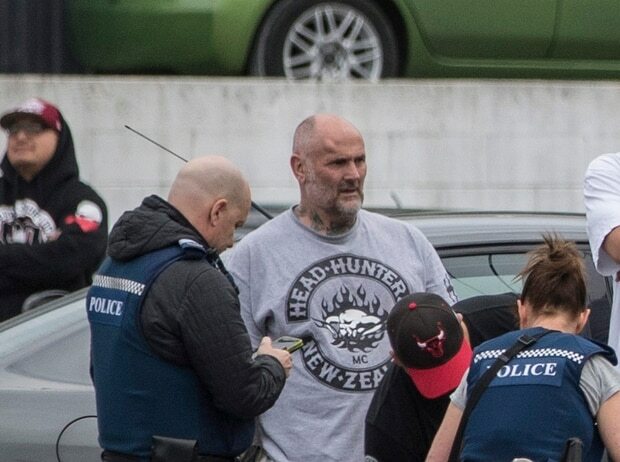 Police swarmed the Head Hunters Motorcycle Club clubrooms in Ellerslie this morning after restraining a senior gang member's property worth $6 million. Police said they had executed search warrants at various locations in Auckland with the support of other government agencies, including the Serious Fraud Office, Customs, the Ministry of Social Development and Inland Revenue. The execution of the warrants followed an investigation into alleged accumulation of criminally derived wealth by a senior member of the Head Hunters gang, police said. This investigation is known as Operation Coin, and has used the powers under the Criminal Proceeds (Recovery) Act to target those deriving income from criminal activity. Police were last week granted restraining orders from the High Court in relation to various properties worth $6 million controlled by the senior Head Hunters member, a 62-year-old beneficiary. Detective Superintendent Iain Chapman, head of the Police Financial Crime Group, said a "significant amount of work" had gone into the operation. "Police are committed to ensuring that people cannot accrue wealth and assets as a result of criminal behaviour, at the expense of the safety of our community," he said. About 15 police officers and seven police cars were this morning stationed outside Fight Club at 232 Marua Rd. A Herald photographer at the scene said both ends of Marua Rd were cordoned off while uniformed police searched the gang's premises. Gang members appeared to be co-operating and no one had been arrested, the photographer said. At least one armed officer was stationed in front of the doors to the gym. Members of the gang could be seen standing to the left of the building, while others were walking around the back of the building. There was also a Customs officer present. Around six officers were later seen leaving the scene, while others remained inside and outside the building. Police dogs were brought out of cars, while the doors to the gym were pulled closed as officers searched the property. Traffic is flowing freely along Marua Rd. A worker from a neighbouring business said police arrived this morning and blocked off the road. He said police officers hid beside the trade factory before they descended upon the Fight Club. Police then began searching cars and talking to occupants of the club. The man said he has worked at the neighbouring business for one-and-a-half years and never had any trouble from anyone at the property. Other neighbouring businesses said they were only made aware of the raid when police arrived at the property. They were not aware what it was for and had no complaints about the Fight Club. A resident nearby on Marua Rd said she felt safe living in the area and had never had any trouble with the club, apart from the odd loud motorbike. Police are seeking any information from the public or professional bodies who are engaged in the financial affairs of the Head Hunters gang.